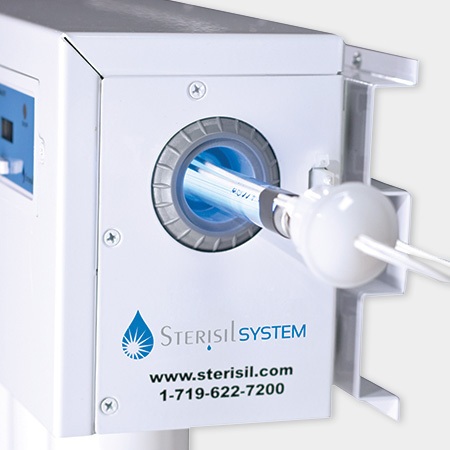 The Sterisil System produces distilled quality water to zero TDS ppm for use in autoclaves as well as treated dental water to keep your dental unit water lines virtually free of bacteria. Designed conveniently to fit into sterilization center cabinetry or mounted on a wall, and is scalable to treat 1 to 100+ dental chairs. 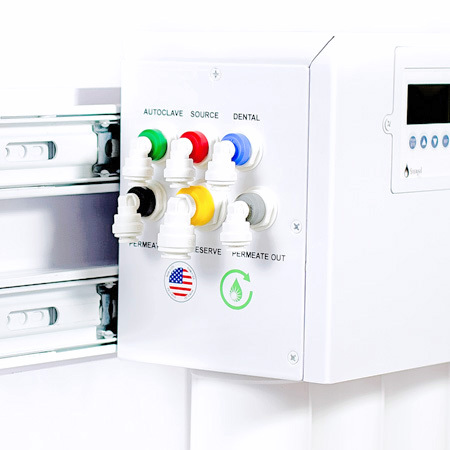 Sterisil has simplified the means for producing treated dental water. This turnkey Sterisil System eliminates the inconvenience and added cost of buying secondary water treatment products. It also provides continuous autoclave water and final rinse water for instrument washers. Gone are the days of corrosive, toxic and expensive waterline treatment products as well as costly and untimely trips to obtain distilled water. The Sterisil System is available in two different versions: Bottle Fill and Direct Feed. 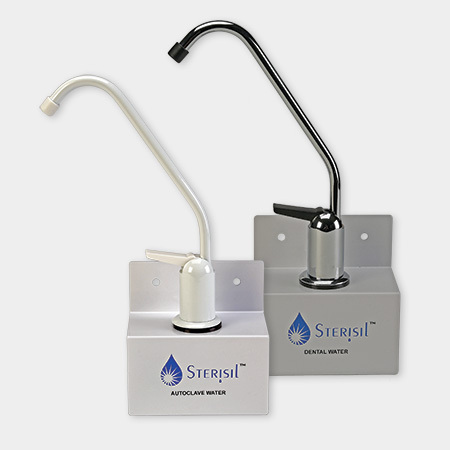 The Bottle Fill Sterisil System comes with a chrome faucet that conveniently provides EPA registered dental water for your bottle reservoirs. 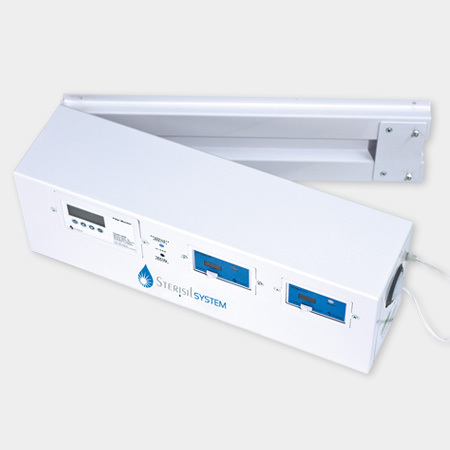 The Direct Feed Sterisil System is typically installed in a new build, remodel or configured in a pre-existing office that has directly plumbed water lines to the operatories. Cartridge replacement only takes 10 minutes per year! Will it treat my entire building/office? No, the Sterisil® System is designed to treat dedicated lines to each dental operatory unit, autoclave or dispensing faucets. What is the life of the filters and UV Light? The life of the Sterisil® System filters and UV light is one year under normal use treating tap water with moderate hardness. If tap water has over 10 grains hardness or high volume of deionized (DI) water is produced for autoclaves, the DI cartridges may need to be replaced more frequently than once a year. The Sterisil® System is equipped with automated monitoring to provide notification of this condition. The DI filters have been depleted and require new replacements. How do I change the filters and do I need to turn the main water line off? The main water valve does not need to be shut off; however, if possible it would be best. 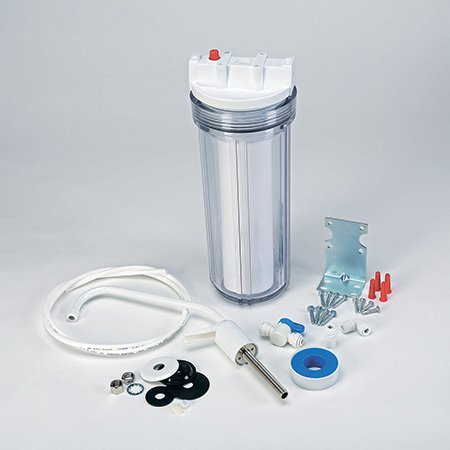 All filters have been fitted with an automated shut off valve. Unplug the electrical ballast, unscrew the filters, remove and replace with the new filters. How do I change the UV light? With the electrical ballast unplugged, disconnect the plug at the top of the UV light. Unscrew the inner UV light fitting leaving the outer threaded portion in place (this is the sealed glass sleeve that separates the UV bulb from contact with water). How do I silence the alarm? No need to be alarmed. There are several possibilities for triggering the alarm. Simply contact Sterisil® Technical Assistance for help in determining your specific trigger [1877-755-7873]. If necessary simply unplug the electrical supply cord to temporarily turn off the alarm. Does my incoming water pressure make a difference? Minimum incoming water pressure of 65psi is required. What is the water level pressure at the storage tank? It is directly dependent upon the source water pressure.